I have some rabbit portions (legs, tenderloins, giblets) on the way from grassland beef. Who has a great paleo recipe for me? Thanks! I like the game recipes from this site: Hunter Angler Gardener Cook. 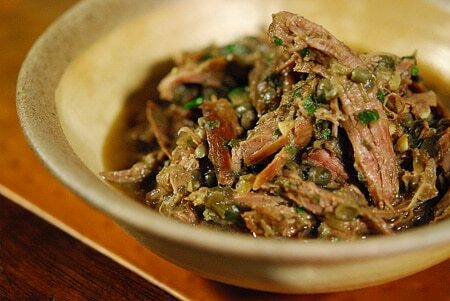 This Sardinian Hare Stew recipe is for rabbit or hare. We eat rabbit regularly. Our favorite is pan frying. Just brown the pieces in some lard for a few minutes, then place a lid on the pan, and simmer for 30-45 minutes, or until done. even without the livers and kidneys. :-) We've added chopped apples and a bit of cinnamon. My Mother in Law marinates it overnight in wine, garlic, crushed red pepper and salt and then cooks it on broil in the oven. Here is a pork recipe but she does this same thing with all meats. It's good. Wow thanks guys, these look awesome. I will def. report back soon. I was thinking of braising in coconut oil and serving over some garlic cauliflower rice but now I have options!